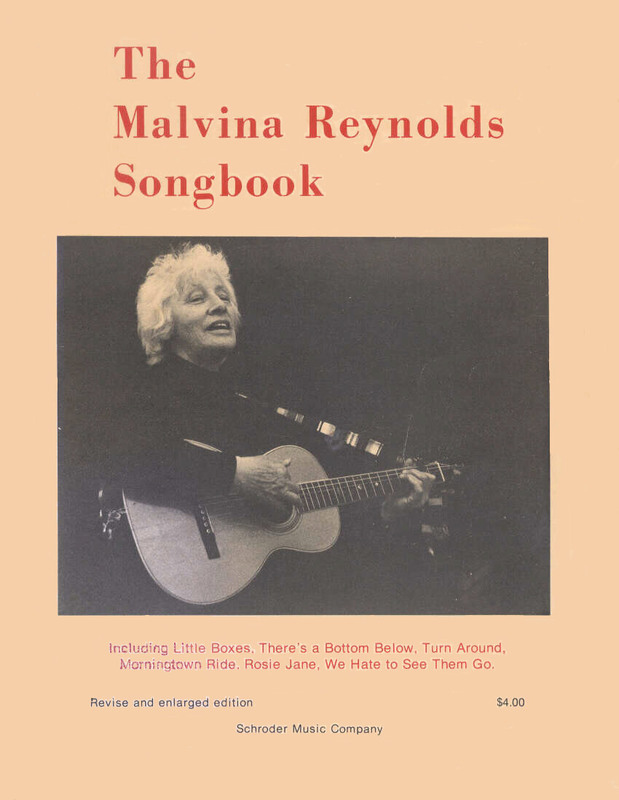 Seven songbooks (collected songs) of Malvina's work were compiled and published during her lifetime. 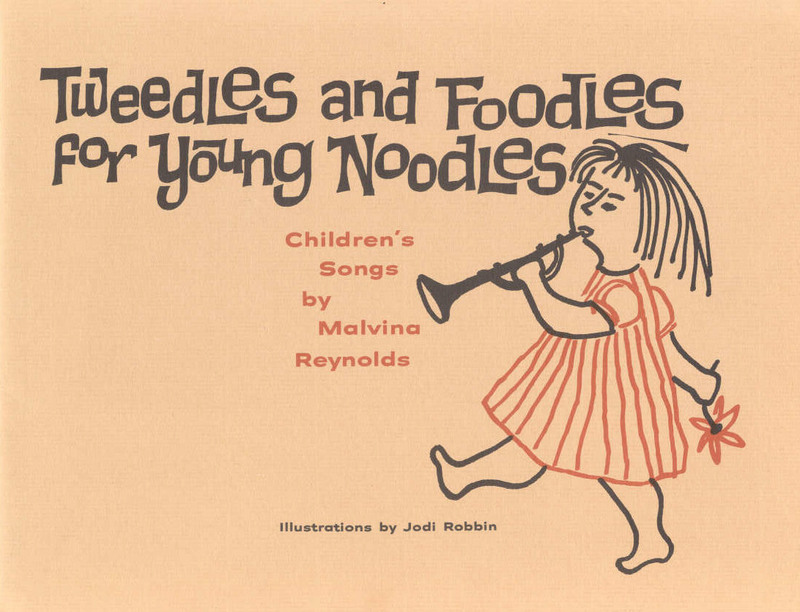 Three of these (Tweedles and Foodles for Young Noodles, The Malvina Reynolds Songbook, and There's Music in the Air: Songs for the Middle-Young) are as of this writing (2/2006) still in print, and may be obtained by writing to Schroder Music Company, 704 Gilman Street, Berkeley CA 94710 (order form at http://www.sisterschoice.com/form.html). Send a stamped, self-addressed envelope and the song title to Schroder if you want a lead sheet for a song that is only in an out-of-print songbook, or a song on this site that is not in any songbook. Almost all are available. More than one hundred eighty of Malvina's songs appear in these seven collections, and many appear in more than one. Two--'Let It Be' and 'Magic Penny'--appear in four of them. The seven songbooks and their contents are listed below, in order of their original publication date, and pagination. 1. Song in My Pocket: Songs. San Francisco, CA: California Labor School, copyright 1954. 16 pp. foreword by Pete Seeger; cover design and illustration by the San Francisco Graphic Arts Workshop. 2. Tweedles and Foodles for Young Noodles: Children's Songs. Berkeley, CA: Schroder Music Company, copyright 1961. 26 pp. introductory words by Malvina Reynolds; illustrations by Jodi Robbin; piano arrangements by Claire Shallit. 3. Little Boxes and Other Handmade Songs. New York: Oak Publications, copyright 1964. 95 pp. 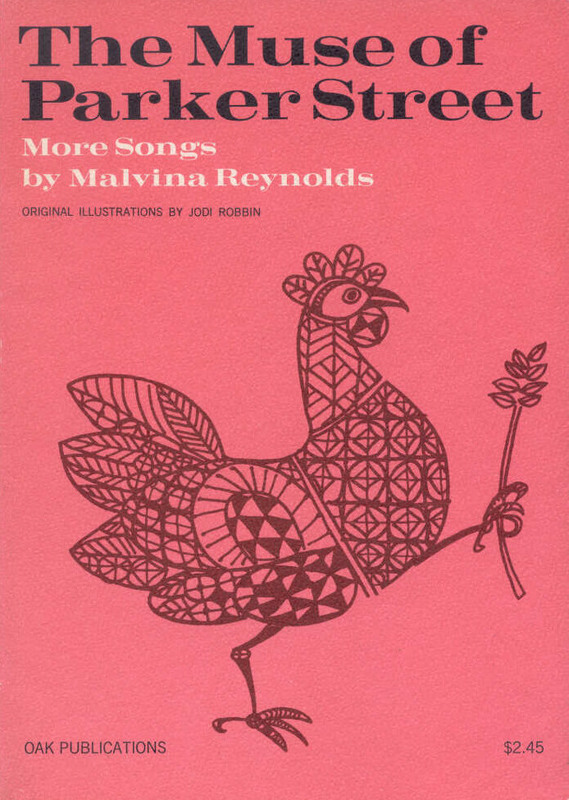 introductory words by Malvina Reynolds; illustrations by Jodi Robbin; cover design and page layout by Ethel Raim; music edited by Jerry Silverman. 4. The Muse of Parker Street. New York: Oak Publications, copyright 1967. 96 pp. foreword by Malvina Reynolds; illustrations by Jodi Robbin; music editor and scribe, Claire Shallit. 5. 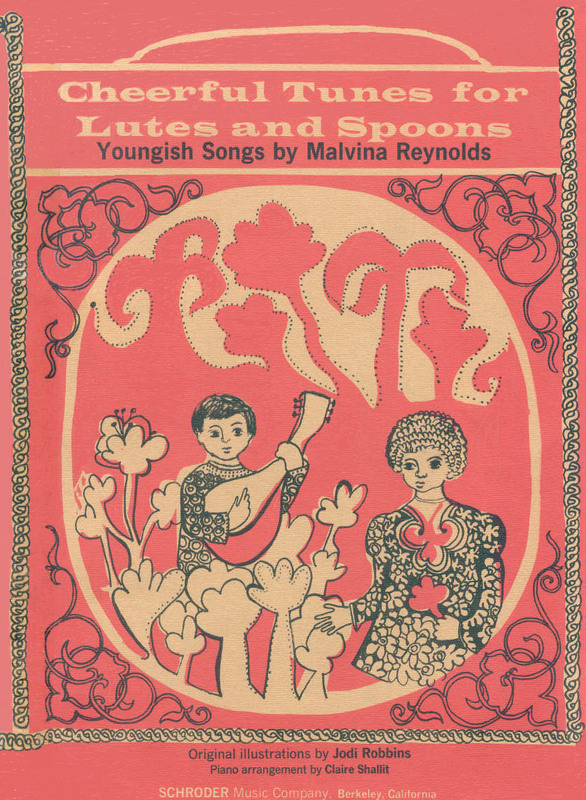 Cheerful Tunes for Lutes and Spoons: Youngish Songs. Berkeley, CA: Schroder Music Company, copyright 1970. 42 pp. introductory words by Malvina Reynolds; illustrations by Jodi Robbin; piano arrangements by Claire Shallit. 6. 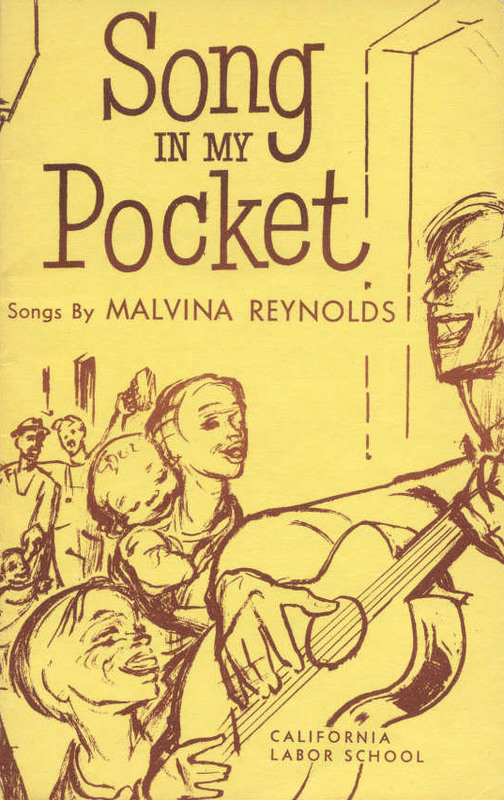 The Malvina Reynolds Songbook. Berkeley, CA: Schroder Music Company, 1974. 96 pp. 2nd enl. ed., 1974, 104 pp. ; 3rd ed., 1974, 103 pp. ; 4th rev. enl. ed., 1984, 112 pp. illustrations by Emmy Lou Packard; book design by Ruth Burnstein; cover photo by Alejandro Stuart; music edited by William Newman. 7. 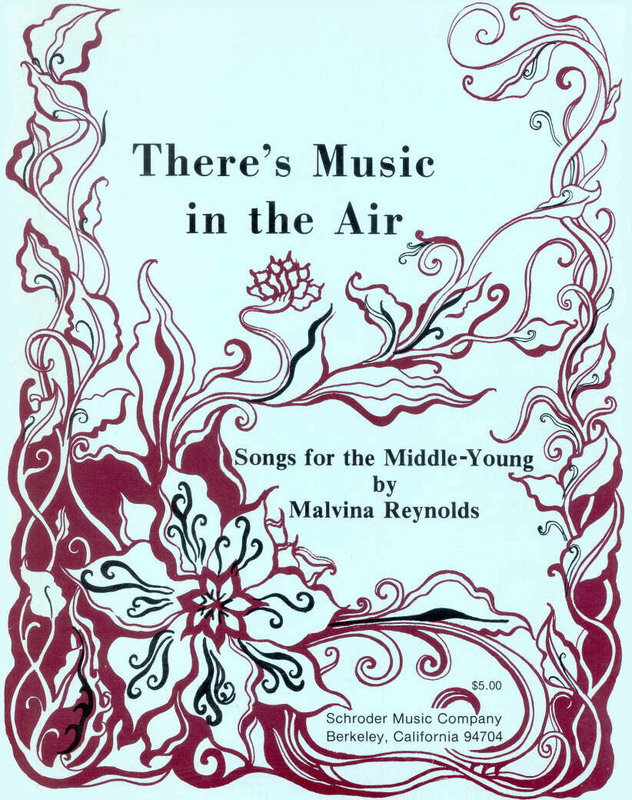 There's Music in the Air: Songs for the Middle-Young. Berkeley, CA: Schroder Music Company, copyright 1976. 95 pp. 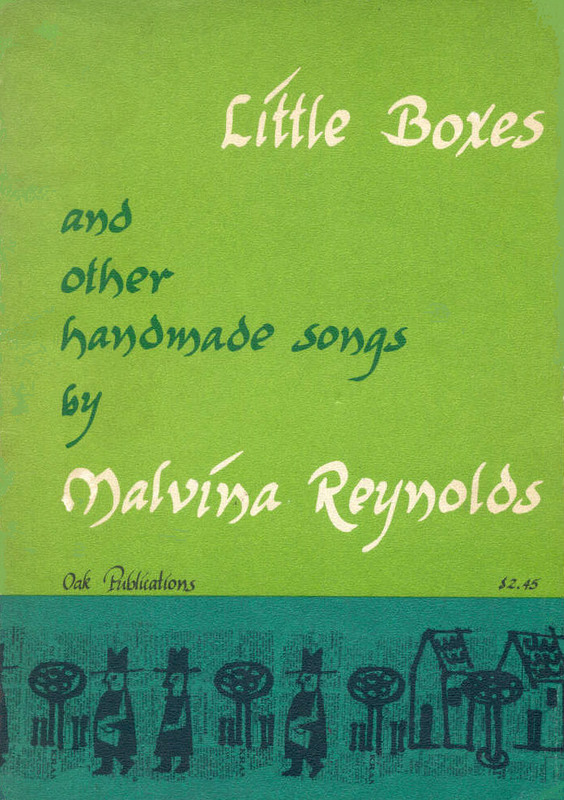 introductory words by Malvina Reynolds; illustrations by Elly Simmons; book design by Ruth Burnstein; music edited by Janet Smith; consultant, Muriel Smock-Miller.